Check out David's very own Author and Historian website here! You'll be £25.00 closer to your next £10.00 credit when you purchase The Hammer of the Scots. What's this? There is a clear and perceptive account of important military events, notably the Battle of Falkirk, but the narrative also encompasses the wider impact of Edward's campaigns. Edward attempted to mobilize resources – including men, money and supplies – on an unprecedented scale. His wars affected people at all levels of society, throughout the British Isles. David Santiuste builds up a vivid and convincing description of Edward's campaigns in Scotland, whilst also exploring the political background. Edward emerges as a man of great conviction, who sought to bend Scotland to his will, yet also, on occasion, as a surprisingly beleaguered figure. Edward is presented here as the central character in a turbulent world, as commander and king. An enjoyable read and a welcome addition to my shelves. Known to posterity as Scottorum Malleus – the Hammer of the Scots – King Edward I (1239-1307) was one of medieval England’s most formidable rulers. In this new history the author provides a fresh interpretation of Edward’s military career, with particular focus on his Scottish wars. This in part is a study of personality, revealing that Edward was in many ways a remarkable man. His struggles with tenacious opponents, including Robert the Bruce and William Wallace have arguably passed into legend. The writer provides an account of important military matters, notably the battle of Falkirk 1298, but as well as providing a description of the campaigns also encompasses the wider impact of Edward’s campaigns in Scotland, looking at the political background. Edward, who attempted to mobilise men, money and supplies on a previously unprecedented scale, emerges as a man of great conviction who sought to bend Scotland to his will. Five maps, three genealogical tables, an epilogue, notes, a bibliography and an index round off the text, which also includes 12 monochrome illustrations. With an insight into not just the military capabilities of the opposing sides, but also the technology, tactics, and logistics of fighting a war in an opponents land, it reveals a great deal more than the general view of Edward I. A great addition to anyone interested in the life of the early Plantagenet Kings. A fascinating and delightful collection of maps from the battlefields of the European Theatre on land, in the air and at sea. With various additional diagrams of rockets and launching systems. 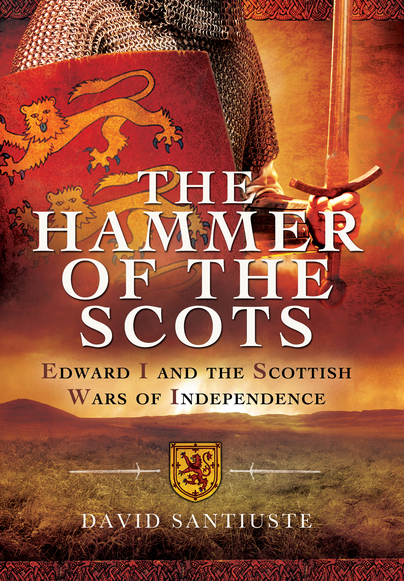 The story of Edward I, Hammer of the Scots and a most remarkable man during the Scottish Wars of Independence. This powerful tale tells of the suffering of thousands on both sides of the border far and beyond those involved in the battles. David Santiuste delivers an interesting look at the first phase of the Scottish wars of independence. Santiuste is showing the signs of an author getting into his stride with this his second book which flows well and is no task to finish. His stated aim is for this text to breach the gap between the entry level broad narrative histories and an in depth academic thesis. ... This is a well written text that is easy to read and makes an interesting contribution to a section of history where there was deemed a gap. My first encounter with the mighty King Edward I was during childhood holidays to North Wales where I followed my father around some of the most stunning castles in the British Isles. I later followed this up by reading Michael Prestwich’s biography of the fearsome ‘Longshanks’. There is always room in the history market for new ideas and interpretation of already well researched subjects and David Santiuste has brought Edward’s wars against the Scots back into the limelight with his well researched and lucidly written new book. It is now twenty years since the Mel Gibson film, Braveheart, hit the cinemas. Although full of historical inaccuracies it was a tremendous romp through some of the events covered by this book. But for those who would like to know the true stories behind the characters of Wallace, Balliol, Murray and Bruce this is an excellent book to obtain. It shows Edward’s strengths and weaknesses, a man already in his 40’s before the matter of Scotland became prominent in his mind. The author covers all the main events in chronological order including the complicated political scene and the battles themselves. Edward in essence was trying to do what the Roman’s had failed to achieve over a thousand years before him and become the sole ruler of ‘Brittania’. He almost certainly had thought of the achievements of the Saxon King Athelstan and was not known as the ‘English Justinian’ without cause. The author also covers perhaps the biggest regret of Edward’s life, that he was never able to take up his wish to Crusade in the Holy Land – perhaps this accounted for his conquest of Wales and his vision for Scotland? For a history book this is a page turner, history was not dry and boring when it was being made, and the author has made sure that his work is accurate, knowledgeable and well written as well as being lucid and entertaining. Though I am already well read in this particular historical era (some of my Yorkshire family were involved in the Scottish wars and one was the keeper of Berwick Castle who handed over the keys to King John Balliol) I thoroughly enjoyed the book and there are always new nuggets of information to find out. A good investment and a great read. Perhaps the author should now turn his hand to Edward’s wars against the Welsh?